Some “light classical” music from India, for this week’s post. This record was recorded in India on October 20, 1910 (thanks to reader Howard Friedman for the sleuthing). 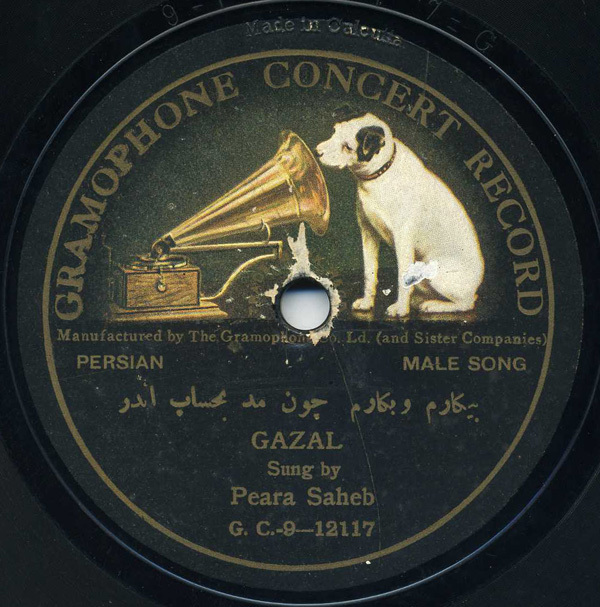 In 1908, the Gramophone Company opened a pressing plant in Calcutta, and this record was pressed there for local distribution. Mr. Saheb was a contemporary of this singer featured in this article, and was also credited on other recordings as “Peara Sahib.” For a more detailed biography on Peara Saheb, I am indebted to Suresh Chandvankar of the Society of Indian Record Collectors in Mumbai, who has graciously allowed me to distribute a recent edition of their newsletter. The newsletter can be downloaded in .pdf format here, and the biography on Peara Saheb appears on pages 14-15. Saheb’s lilting voice is accompanied here by harmonium and percussion, and he sings a ghazal, an ancient poetic form originally from Persia. Listen closely at the very end of the track for a common occurance in early Indian music: the singer announcing himself in English. It’s a beautiful piece of work. If you’re interested in more information on early recording in India, there’s this article. There is also the fine article by Gerry Farrell in the British Journal of Ethnomusicology (Vol. 2, 1993), titled The Early Days of the Gramophone Industry in India: Historical, Social and Musical Perspectives. There is also yeoman’s research by Michael Kinnear in his book The Gramophone Company’s First Indian Recordings (1899-1908). That’s it! Not sure how I missed it though… Anyways, I love that song! Thanks for anticipating my request. Yes, I actually point out the gender confusion in my text. Personally I think the most interesting thing about the record is the fantastic music! Actually, the above comment by Howard is incorrect….Peara Saheb IS a male, so the label correctly states “male song”. Yeah, but he was originally referring to my first edit of the post, which claimed it was female too. My bad! Suresh set me straight! Very interesting re: Gaisberg, though! wonderful site, but where can we hear the recordings you have deleted from your website? peara sahib was MALE, not female. If you read the blog post, Mr. Saheb is listed as a male singer. JW is doing a remarkably great deed in presenting the the work of Legendry Greats on his Website. Mr. Chandavarkar work in India is no less, despite the lack of The state of the art Technicaltools JW has access to. Kudos to BOTH and other who are involved in this examplery though’UPHILL’ task. There is a punjabi song recorded by Peara saheb in 1906. The song begins with the words “Batua goondan de bo majajia doran tut gayii chaar. ” can anybody help in providing the lyrics of this song?